Castle Urquhart stands on a rocky promontory on the north shore of Loch Ness. As soon as you get here you cant help thinking, "Well, if I were going to build a castle to survey this wide glen, and the loch itself, this is where I'd build it!" In fact people were almost certainly here at least 4000 years ago. At nearby Corrimony is a burial cairn dating from about 2000 BC. However, although some evidence has been found of a fort on this promontory dating from the Iron Age, and also remains from Pictish times, earliest written records for the existence of a castle date from the 1200's. Loch Ness cuts a great divide along what is called Glen Mor, or The Great Glen, a 60 mile fissure scoured by glaciers during the last ice age. The Loch itself is over 700 feet deep, and the nearby surrounding hills rise by about the same amount. At the north east end, where the waters of the loch flow along the River Ness through Inverness and into the North Sea, is the flatter and more fertile land of Moray. Around the middle of the first millenium AD St Columba travelled fom dalraida in Argyll on the West coast of scotland, and converted Emchath, a Pictish nobleman living in Glen Urquhart sometime before 597. In 1228 the people of Moray rose up against the authority of King Alexander II (1198 - 1249). By 1230 he had put down the revolt and, as conquerors often do, established his own loyal men in charge of estates in the area. He granted his son-in-law Alan Durward the lordship of Urquhart, and it is almost certain that the earliest parts of medieval castle date from his time. After his death in 1275 the castle passed to John Comyn, appointed by Edward I of England. After a series of humiliating defeats John Balliol (1250 - 1296) had relinquished his kingship, and much of Scotland and many of its castles, including Urquhart, were under English control. This was the time the Stone of Destiny was taken from Scone to London, (it's now back in Scotland) and also the time that William Wallace began his campaign against English rule when he killed an English sheriff at Lanark. In 1297 Andrew Moray of Moray led a night-time attack on the castle which failed, but sometime later Sir Alexander Forbes retook it for Scotland. But that wasn't the end of it; in 1303 Edward again took the castle, but his garrison under Alexander Comyn of Badenoch was soon annihilated by Robert the Bruce who was to be crowned King of Scotland in 1306. By 1346 ownership of the castle passed from the Earls of Moray back to the Scottish Crown again, and it seems likely that with Crown money much substantial building and repair was completed at this time. 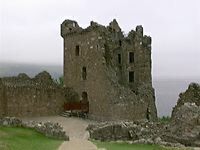 Throughout the end of the 1300's and well into the 1400's Castle Urquhart fell again and again to Clan MacDonald, Lords of the Isles only to be retaken again and again by the Crown. The only consequence was the suffering and devastation of the ordinary people living in the Great Glen. Eventually the MacDonald's power was temporarily curbed in this area and for about 35 years the Grants of Freuchie looked after the castle on behalf of the Gordons of Huntly. But soon the MacDonalds were back; in the 1500's they besieged it twice, again leaving the ordinary local inhabitants of the Glen dead and devastated. By the 1600's the castle was abandoned by the Grants to the people of the Glen. Those walls which had for so long been a cause of suffering to them, now became their comfort as they dismantled masonry and removed stones to build their own houses. Finally, in 1689 when the last Stewart King, James II of England and VII of Scotland, was exiled, one Captain Grant and 300 Highlanders saw off a force of James's supporters. The garrison left the ruins in 1692. The castle was not repaired, and about 25 years later it was reported that a "Storme of Wind" had blown down the south west side of the main tower house. View of the loch from a window in the Tower. The castle is open to the public, under the control of Historic Scotland.